Addressing a rally at Ghazipur in Uttar Pradesh last week, PM Narendra Modi had said the Congress promised loan waivers to lakhs of farmers, but the JD(S)-Congress coalition in Karnataka did not deliver. 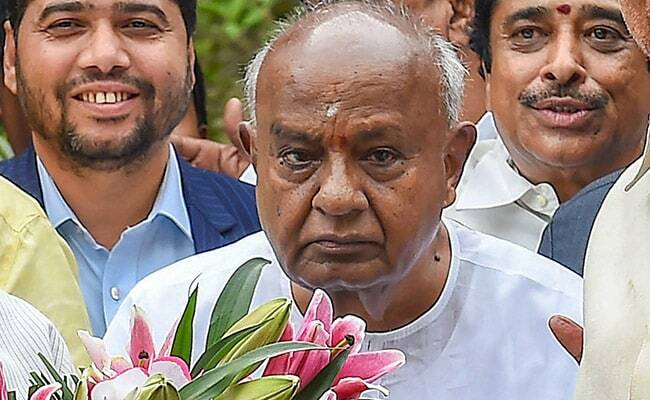 Former Prime Minister HD Deve Gowda Wednesday hit out at Prime Minister Narendra Modi for taking a jibe at the Karnataka government's farm loan waiver scheme and questioned him about demonetisation and the Ram temple issue. "I have observed taunting statements of @narendramodi on Karnataka's crop loan waiver scheme. Dear PM, more than 60,000 farmers have already received money directly into their bank accounts. We are determined to keep our promise to the farmers and are acting on the same lines," Mr Gowda said in a tweet. "Dear @narendramodi, if your index finger is busy questioning us, the other fingers are questioning you about demonetisation, Clean Ganga, inter-linking of rivers, Ram Mandir and other unfulfilled promises. Please remind yourself about how you treated farmers during protests in Delhi," the JD(S) chief said in another tweet. Addressing a rally at Ghazipur in Uttar Pradesh last week, PM Modi had said the Congress promised loan waivers to lakhs of farmers, but the JD(S)-Congress coalition in Karnataka did not deliver. "Lollipops" were handed out. The loan waiver was given to only 800 farmers, PM Modi had claimed. Also, taking on the state government over loan waiver scheme, PM Modi, while addressing party workers of the state via video conference, on Friday had termed it as the "most cruel joke on farmers". PM Modi's comments had drawn sharp criticism from Chief Minister HD Kumaraswamy and Congress leader Siddaramaiah. While Mr Kumaraswamy had accused the Prime Minister of misleading the country for "political gains, Mr Siddaramaiah questioned PM Modi's "moral right" to criticise the state government's farm loan waiver scheme and called him "anti-farmer". The Kumaraswamy-led state government had announced over Rs 45,000 crore loan waiver scheme in July, soon after coming to power. But it has been bogged down by several issues relating to banks.